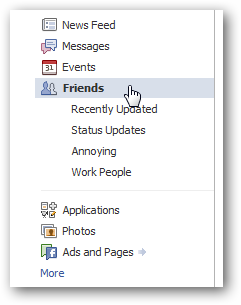 Everybody’s got that one family member on Facebook that you just don’t want to talk to, but they bug you every time you sign into Facebook chat anyway—here’s how to sign on without them seeing you. 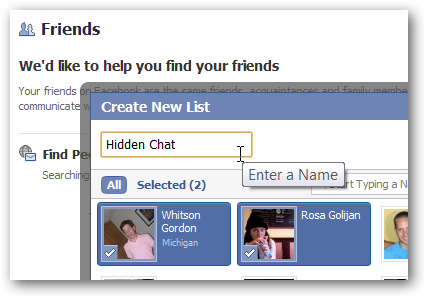 First, you’ll want to give the list a name—I chose “Hidden Chat” since it seemed logical. Next, add your annoying family members and co-workers to the list, as well as anybody that doesn’t eat delicious Reuben sandwiches. 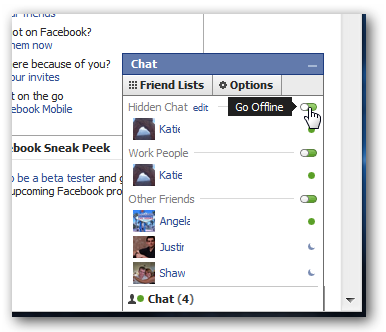 Now pop up your Facebook Chat screen, and click the little green toggle switch. At this point you’ll be signed out for those people. Yay! 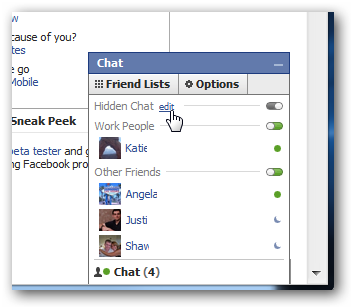 You can also easily add or remove people from the Hidden Chat list by just clicking the little edit link that launches the List edit screen. Thanks to Brenna for pointing out this tip.